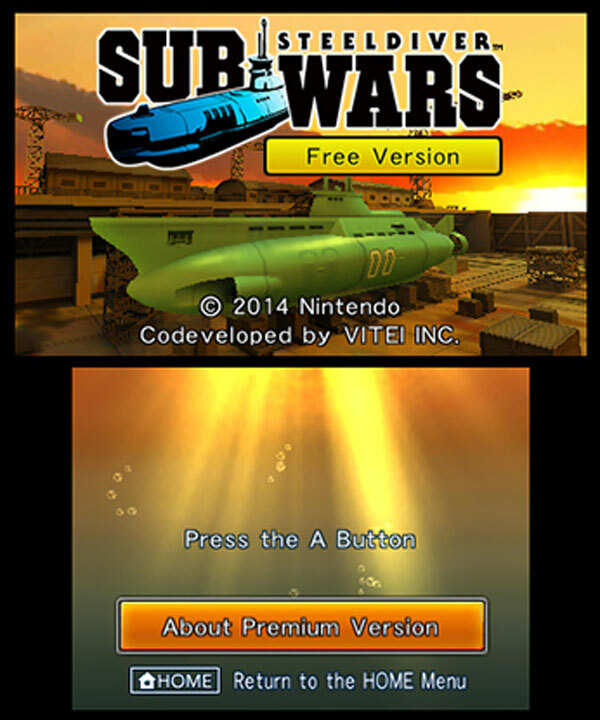 Battle against your friends in high-tension submarine warfare! 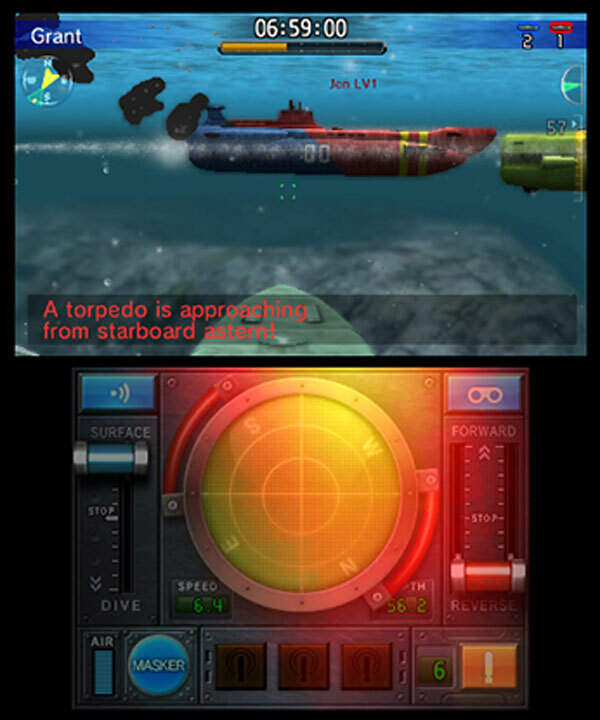 Battle your friends* and the world in high-tension submarine combat! Command your submarine and crew either locally or over the internet** in four on four team battles. Unlock new submarines by increasing your online rank or by earning medals in offline single player missions. Hone your skills to perfect the art of warfare and rule the seas! An ocean of challenges await the nautically gifted in single player skirmishes. Call in an air strike with Morse code or take on a massive fleet… all on your own! As you rise in rank and status, assemble your submarine’s crew strategically, as each shipmate carries unique strengths and weaknesses that will alter your gameplay style. 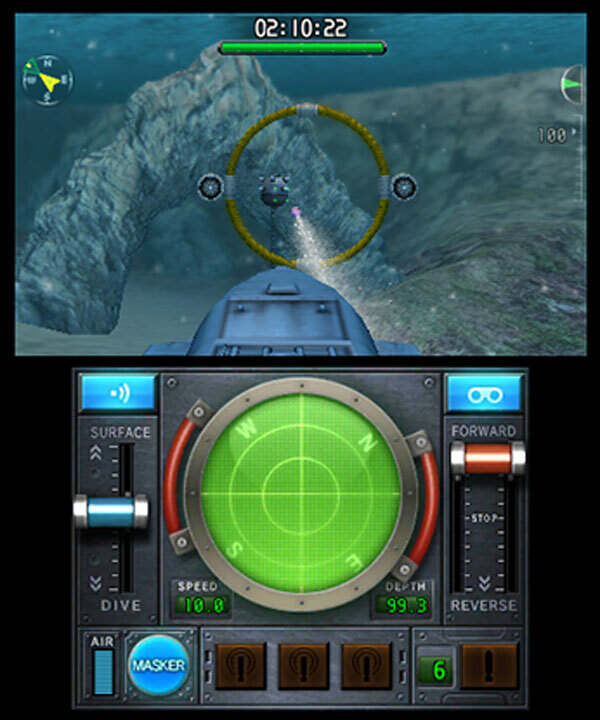 Steel Diver: Sub Wars is better and more focused than its precursor. The slow, calculated multiplayer matches afford plenty of opportunity for strategic fun, though the single-player mode is more a tutorial than a substantial component. While the premium content is substantial, offering many more submarines and the addition of customizable crews, free players aren’t at an insurmountable disadvantage. Nothing is polished, from the almost unfinished sub models to the dreary-looking ocean depths with an even drearier draw instance. It's uncharacteristic for Nintendo, especially this late in the 3DS' lifecycle. The "morse code" chat system mechanic is awesome though, since it fits right into Nintendo's "safe" online methodologies and the theme of Sub Wars itself. 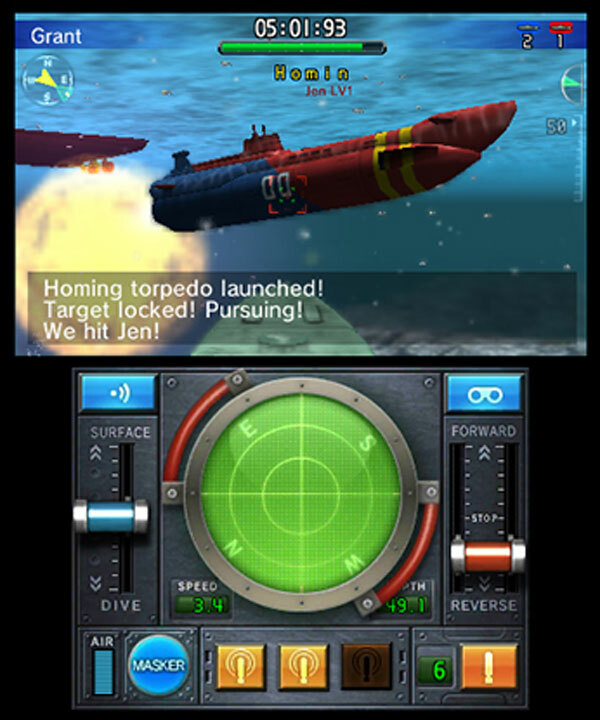 Whether or not you're willing to pay for some extra features, Steel Diver: Sub Wars features a highly enjoyable online multiplayer mode; that's something, perhaps, that the 3DS has missed so far. Since it's free, you have no excuse not to check it out — perhaps you'll even like it so much that you'll spend some money. Nintendo ha querido dar continuidad a una de las propuestas primigenias que acompañaron al lanzamiento de Nintendo 3DS. Steel Diver: Sub Wars nos sumerge de nuevo en un arcade protagonizado por submarinos que ofrece una jugabilidad bastante más relajada y sencilla de la que suele ser habitual en este tipo de juegos, resultando entretenida a corto y medio plazo pero carente de "punch". Por lo menos el modo multijugador anima las cosas un poco. Die Steuerung ist eine nette Idee, die Kulisse in Ordnung, der Rest ziemlich überflüssig. Steel Diver: Sub Wars ist genauso langweilig wie sein Vorgänger, auch wenn die sieben Missionen immerhin versuchen mir Abwechslung vorzugaukeln. Der öde Mehrspieler-Modus und die notwendige Wiederholung der Missionen machen den Unterwasser-Ausflug zu einer passablen Einschlafhilfe. Mas a oferta do conteúdo "premium" ainda é significativa e, por mais dez euros, o conteúdo oferecido proporciona valor adicional. Não obstante o design minimalista e poucos modos de jogo, o melhor de Sub Wars reside na natureza estratégica das batalhas e no modo online que faltou a Steel Diver. Steel Diver: Sub Wars é uma boa entrega por parte da Nintendo no mundo dos Free To Play, qualquer um pode (e deve) descarregar a versão gratuita, nem que seja para lançar uns torpedos online e enviar umas mensagens em código morse. Aqueles que decidirem pagar pela versão premium para ter acesso ao resto do conteúdo terão acesso a uma experiência mais personalizável e profunda que os restantes. L’approccio quasi simulativo al mondo dei sottomarini dà un nuovo tono pacato alle meccaniche sparatutto, che comunque appagano e, perché no, si meritano anche di essere esplorate ulteriormente con l’acquisto della versione Premum e i suoi piccoli, succosi extra. 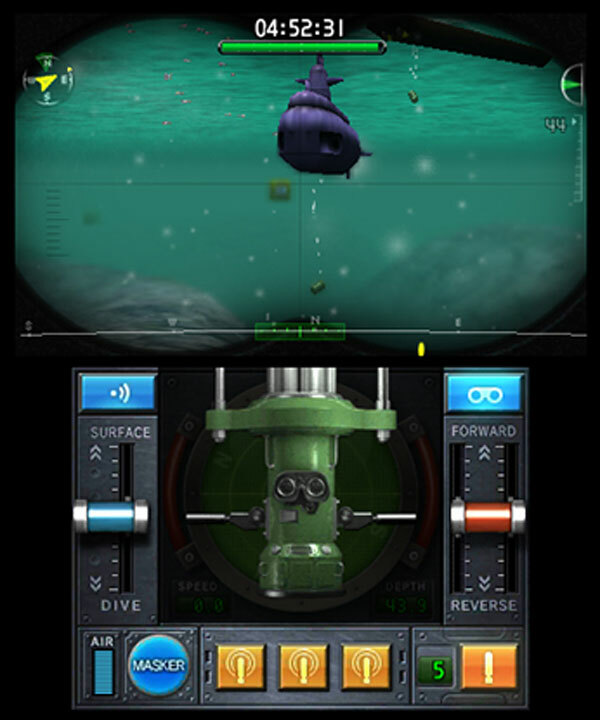 Steel Diver: Sub Wars is een game die eigenlijk beter onder water had kunnen blijven. Nintendo komt dan wel met een free-to-play game, wat op zich een nobel streven is, en ook de opzet is in orde wat betreft het gebruik van extra content. Helaas verpest de traagheid en eenzaamheid die je in de game beleeft alles.